Our tasting notes and glass at the Triomphe vertical tasting. A library tasting (sometimes called a vertical tasting) is when you sample the same wine from the same producer ranging across several vintages. The idea behind this type of tasting is to see how a particular wine ages. This gives consumers some idea of what the current wine might become. This event focused on the Triomphe. In an effort to mimic a Côte-Rôtie, each of these blends is based on Syrah or Petite Sirah with a splash of Roussanne or Viognier added in for aromatics and complexity. A plate of cheese for the Triomphe vertical tasting. 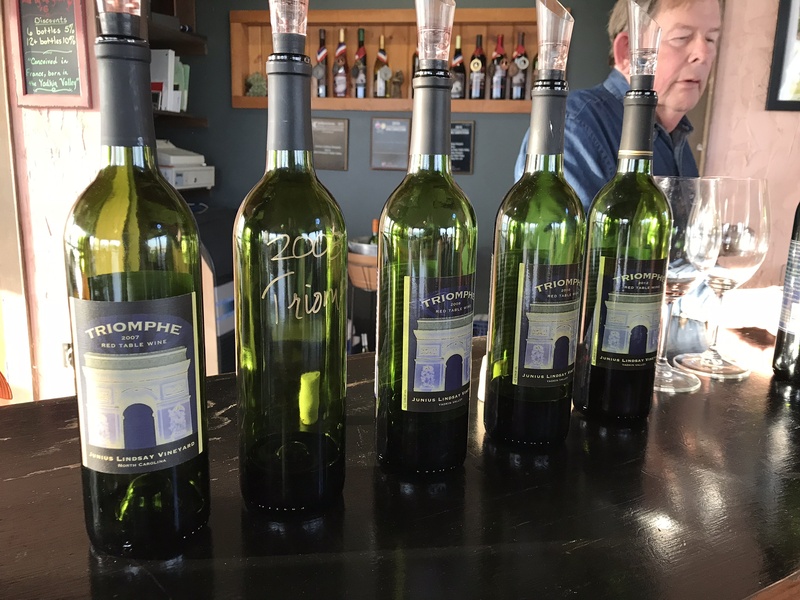 The tasting event featured five vintages of Triomphe starting with 2012, skipping to 2010, and then consecutive vintages back to 2007. The event itself was a seated event. A small group of 15 or so were seated at tables in the middle of the tasting room. Michael poured each wine and we took a few minutes to enjoy the wine before we discussed as a group. Also on the tables was a spread of appetizers to pair with each wine. We sipped, savored, and discussed the finer points of each vintage that we enjoyed. Michael looking out at the crowd during the Triomphe vertical tasting. At the end of the event, there were two wines that really resonated with the group. The 2010 vintage was a classic example of Junius Lindsay wines. This was closely followed by the 2007 vintage, which was remarkably rich with ample fruit still kicking around. Read on for our tasting notes on the featured vintages. We also include two bonus samples as well as a special treat of the evening, a 2007 Roussanne that Michael found and was holding for an occasion just like this. If you missed this event, don’t fret. Michael plans to hold more of these events throughout the year. To find out more, sign up for their newsletter on their website. 2012 – This vintage was lighter in color resembling fresh squeezed cherry juice. The nose is a blend of bright red cherry with an undertone of toasted wood. Cocoa powder came through on the flavors with firm acids throughout. 2010 – This particular vintage was complex. The nose was layered with sticky tobacco, leather, and a smokey note. It conjured images of a well-used study, filled with leather-bound books and heavy furniture. The acids on this wine were pronounced and blended nicely with the complex flavors. 2009 – The nose was good, but not as vivid as the 2010. There was less leather and a little more smoke and white pepper. Overall it was a bit lighter in body and higher in acidity. The finish had a pronounced white pepper note that made this wine very food friendly. 2008 – The color was much more intense and well-balanced overall. The acids cut through and carried the flavors from start to finish. It was nice with food, but it didn’t amplify the wine which as it easily stood on its own. Overall this wine was more contemplative and nuanced. Medium-plus tannins came through and lingered into the finish. 2007 – Overall, this wine was much darker with a bold nose of sticky sweet fruits and tarry leather. Caramel and vanilla came through on the flavors with tomato jam on the mid-palate. Cocoa powder came through on the finish with a rich velvety texture. 2013 Triomphe – This is the current vintage of the Triomphe blend. The acids were front and center and more pronounced. Fresh red fruits and mild spices came through as well. Mild juicy fruits show up on the finish and linger a bit. 2016 Viognier – Tropical fruits were strong on the aromas. Fresh pineapple, mango, and a touch of papaya came through on the flavors. It was well-balanced with fresh acids and a steely mineral finish. A bottle of 2007 Roussanne that was opened during our library tasting at Junius Lindsay. 2007 Second Leaf – This was the first vintage produced of this wine. Newer vintages typically blend Viognier and Roussanne, however this vintage was 100% Roussanne. At 11 years old, this wine is still brilliant. Peach and apricots came through strongly on the nose. Assorted white flowers and floral notes appeared clearly in the flavors. Mild acids and an oily and viscous texture intensified the flavors. This truly was a treat to experience. Not too long ago, we did a spotlight on Roussanne. Check out the post here.